RoboHelp: It is a Help Authoring Tool, released in the year 1998. Arbotext Editor: It is the first SGML based editing tool, released in the year 1991. Articulate: It is an e-learning software and authoring tool. Adobe Captivate: An e-learning tool used for screencasts, podcasts etc. It can import PowerPoint Slides. Adobe FrameMaker: It is a document processor(arrangement of document components) used by many professional Technical Writers. DITA (Darwin Information Typing Architecture): It is designed as an end-to-end architecture. DITA is an XML data model for authoring. DTD (Document Type Definition): It defines a document type for SGML markup languages. This family of SGL markup languages include XML, HTML etc. AuthorIT: It is a help authoring tool. It was released in 1996 as help authoring tool and content management system(CMS). 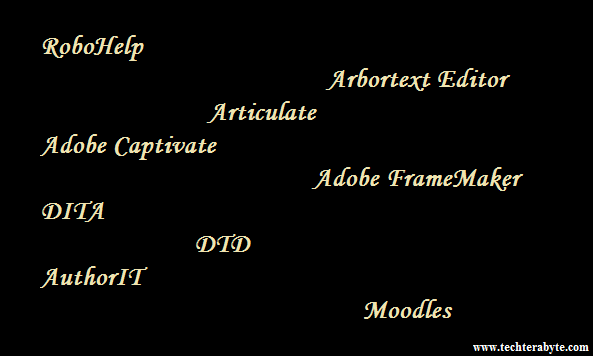 Moodles (Modular Object Oriented Dynamic Learning Environment): It is an e-learning platform released in 2002. It is also known as "Learning Management System" or "Virtual Learning Environment"